For anyone looking to learn paper piecing. For anyone wanting to improve their paper piecing skills. For anyone wanting to come sew this beauty with a group of friends! You get to choose between Bloomin' or Bloomin Too! by Sam Hunter for this class (included in your class fee). 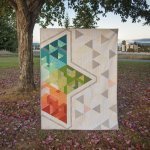 This cheerful modern quilt is a great stash buster! Use up all those fat quarters and stray 2?? strips you have laying around. Entirely strip pieced, this quilt is easy enough for the confident beginner or a quick weekend retreat project. The colors grade from light to dark so the star looks like it?s bursting. This quilt was designed with kids in mind; jazz up their bedroom or change up the colors and make it patriotic! Learn the basic techniques of English Paper Piecing (EPP); learn to wrap fabric on the paper, thread basting without going thru the paper, joining the petals to make a flower. At the end of the class, you'll leave with a hexie mug rug. How many time have you wanted to set your project on fire when it's just not going the way you planned it? Come learn how to Explode your quilt instead! Learn the basics of using our long arm for freemotion quilting. We'll cover best practices for loading your quilt, how to choose thread, and what to do once you are in control! We welcome your questions and will wrap up after each student has a chance to 'get behind the wheel'. A perfect class for anyone looking for a quick and fun project! This month we will be using Purple Pineapple Studio's Hex on You pattern (included with your class fee). The class focuses on accurate cutting, achieving a consistent 1/4 inch seam, and the flip & flops of pressing. Bring along your walking foot and we'll get the quilting started before class ends! Finished size: 60" x 76" If you would like help selecting fabrics we are happy to help! Come by the store and we'll get you all set up. You bring the shirts, we'll help you figure out how to make your quilt!